Jo Kilmer got her start as a rustic artist in Missouri in 1995, where she first learned the art of bentwood furniture construction, using locally gathered willow. She progressed to working with willow bark in baskets, cabinets and jewelry. Jo and her business, Spirit Tall, relocated to Murphy, NC in 2006. Adapting her craft to include materials found in the Appalachian mountains of WNC, she added a line of whimsical twig dragonfly pieces using native mountain laurel, and incorporates other local wood in her current work. Jo has received many awards and recognition for her art, including acceptance in the well regarded Rustic Furniture Fair of the Adirondack mountains. She travels extensively, sharing her skills, and has taught at Daniel Mack’s annual Woodlanders Gathering in Mineral Point, WI. Jo is a featured artist in Making Willow Furniture: Three Women Share Their Art, by Bim Willow. 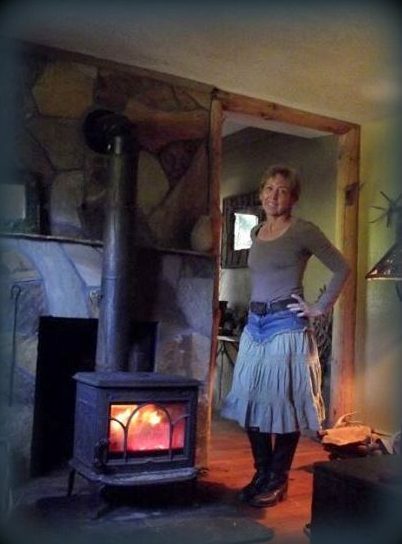 Aspiring rustic builders are invited to join Jo and Spirit Tall for fun and informative hands on workshops at her mountain studio in Murphy, NC, nestled in the Smoky Mountains and just a few miles from the John C Campbell Folk School. Jo welcomes all inquiries from those interested in carrying her high quality, hand crafted, and affordable products.